This audio description has been compiled by Colin Hambrook in February 2018. It was commissioned by Disability Arts Online on behalf of NDACA (the National Disability Arts Collection and Archive). It is read by the author. It is approximately 9 minutes long. This is a poster for the Graeae Theatre Company production Sideshow. The stark black and white flyer has the company name in white block capitals at the top of the page with a high contrast image of the face of actor, playwright and film-maker Nabil Shaban below. 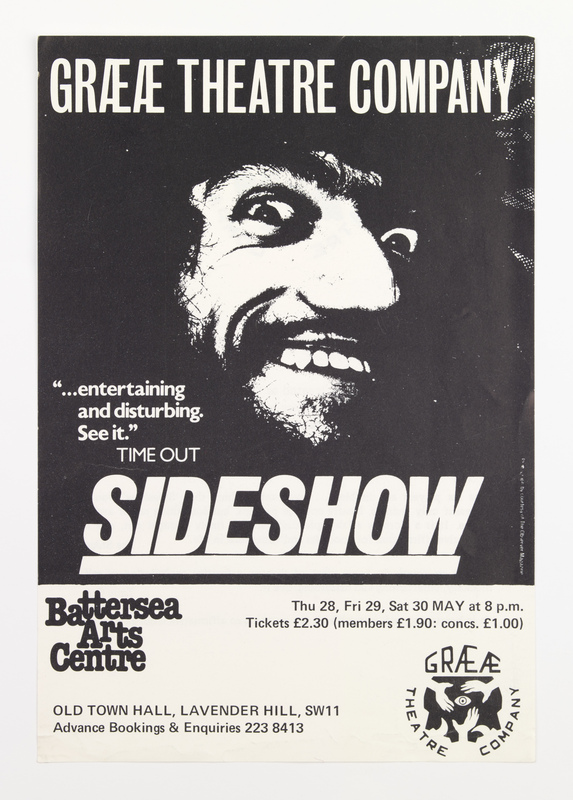 Sideshow was Graeae Theatre Company’s first production, written by Richard Tomlinson and the company. Tomlinson first began working on the production with fellow Graeae co-founder Nabil Shaban and others at Hereward College for the Disabled in Coventry, where Tomlinson was a lecturer. An earlier version of Sideshow titled ‘Ready Salted Crips’ (‘Crips’ being an abbreviation for “cripples”) was devised at Hereward in Spring 1975. The group were invited to perform at the International Conference on Rehabilitation and Disability in Winnipeg, Canada in 1980, and a short tour to take place just beforehand was organised for them in the US by the University of Illinois, where Richard Tomlinson had previously studied. Shaban and Tomlinson began recruiting a cast for a touring production of Sideshow in 1979 in London when Tomlinson took on the role as senior adviser for disabled students at the Open University. He and Shaban started to forge plans for putting together Britain’s first disabled-led theatre company. They had a name: Graeae, the three old sisters of the Gorgons from Greek mythology, with one eye and one tooth between them. Shaban said in a Guardian article: “The idea of using something from mythology to dispel misconceptions about disability was very important, and we wanted to contain that notion within the name of this embryonic theatre company.” Their vision was to use theatre, workshops and training to dispel prejudices and to counter images of defencelessness and accepted myths about disabled people. It took several months to find six disabled performers, three men and three women, to take Sideshow on the road. Each performer had a different impairment. Nabil Shaban with brittle bones, Marion Saunders had muscular dystrophy, Jag Plah had cerebral palsy, Elaine Roberts was a blind person, and Will Kennen became disabled as a child after a road accident. Alex Low had spina bifida and the stage manager was hard of hearing. Turning personal stories about disability into performable scripts and acting them in front of an audience produced electrifying results. For the first time, disabled people were able to control their non-disabled audience, to explain frankly, but without bitterness, exactly what it feels like to live with an impairment. Rehearsals took place at the Diorama near Regent’s Park in London. At this stage there was no interest in what they were doing at home but they managed to organise small premieres at London and Surrey Universities before leaving for North America. Sideshow was a huge success in the US where they played to full houses, were guests on chat shows and had excellent media coverage. In Canada they performed to over 700 people who had come from all around the world to attend the conference. On their return, they suddenly found everyone was interested in them – including the BBC who aired an Arena documentary in 1981. Nabil Shaban, who had no previous booking experience, began setting up a UK tour and in January 1981 they staged their performance for the UN’s International Year of Disabled People at the Riverside Studios, Hammersmith. “Richard wasn’t happy with the Sideshow script, felt it needed a better ending, and so he was still writing it as he drove half the cast to our first performance at Surrey University. I was already at the venue, getting nervous and impatient, waiting for Richard to arrive with the other half of the company, having to make apologies to the organisers for the delay. Nabil Shaban was born in Amman, Jordan. As a child he was sent to England for medical care and grew up in a series of hospitals and residential homes, where he had minimal contact with his family and was expected to achieve little educationally. His struggle to gain an education took him first to Hereward College and then to the University of Surrey where he gained a BSc degree in Psychology and Philosophy. Shaban continued on the Board of Graeae through the 1980s and returned to appear as Volpone in Flesh Fly in 1994. His screen roles through that period included the role of Sil in Doctor Who and the films Born of Fire (1983) and City of Joy (1992). Since 2000, Shaban appeared in several productions at Theatre Workshop in Edinburgh, including co-devising D.A.R.E (Disabled Anarchists’ Revolutionary Enclave). Originally commissioned in 1996 by Graeae, his play The First to Go, about the Nazis treatment of disabled people, was produced and toured by Benchtour productions.